Our retail outlet Mr Mister, located in the centre of Barrow-in-Furness, has been at the forefront of wedding and evening suit hire in South Cumbria for more than 20 years. The knowledge and experience we’ve gained in the suit hire business means we work with a range of the best suit suppliers in the UK to give our customers unrivalled service for price, quality and selection. Unlike large stores that have to offer the brands dictated by their head office, we’re able to use quality brands we know our customers like. That is why our main supplier is Peter Posh. We use Peter Posh because they have some of the best ranges available, with the best quality. Unlike some of their rivals they use European manufactured suits and British made waistcoats and neckwear guaranteeing high quality and consistency of fabric. Uniquely in the South Cumbria area, we also carry a large amount of stock ourselves in addition to the Peter Posh range. This means we can supply some items and sizes to our suit hire customers the same day. We also have items unique to Mr Mister, meaning you can be as individual as you like. 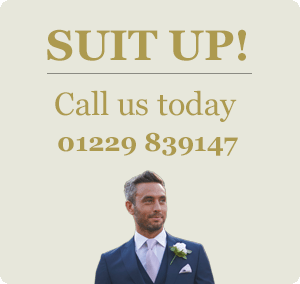 If you’re planning a wedding that’s little bit different, you may want to consider buying from our superb range of suits, neckwear, waistcoats and shirts. Finish Your Outfit With the Perfect Pair of Shoes! Your suit needs the right shoes. With the increase in interest in blue and grey suits we have now added tan or black brogue shoes to buy (at only £25.00) that complement and finish that perfect outfit. Almost all our hire suits and accessories are available in boys sizes so if you want them to match we can do that too! If you don't want them to match, we also have boys three-piece suits to buy, from as little as £48. Finally the kilts. Our other supplier is ACS, kilt hire specialists. If you would like to know about our kilt hire just call in for one of our brochures. With access to more than 2 dozen kilts and various jackets and accessories there’s sure to be a combination you will like. Barrow In Furness Cumbria LA14 1ST.